Set on 600 acres in the foothills at the northern edge of Tucson, the member-owned Lodge at Ventana Canyon flows through a scenic desert landscape backdropped by the Santa Catalina Mountains. Accommodations consist of 50 one- and two-bedroom kitchen-equipped suites, none smaller than 800 square feet and arrayed along a two-story brick building so that each of its large patios and balconies has a view across the palo-verde studded golf fairway at the mountains beyond. From any of the rooms it's a short stroll to a complex of 10 hard courts, one of them a sunken stadium, and the adjacent eight-lane Olympic-sized pool and a new free-form pool, the latter surrounded by a vast patio with a splash pad, umbrella tables, and chairs. Those amenities vie for attention with two Tom Fazio 18-hole golf courses laid out along and into the foothills and they are complemented by a day spa and fitness center. Guests and members also have access to an unusual amenity: the services of a Clef d'Or concierge, one of only three in Arizona, someone who not only knows about everything going on in town but also has contacts with other concierges all across the country. Jonas Ehrlin has returned to the Lodge at Ventana Canyon as Director of Racquet Sports, a position he previously held from 1995-2002. A native of Sweden, he came to the U.S. to play for Weber State University in Ogden, UT, where he became the all time winningest player both at his school and in the Big Sky Conference, a distinction that earned him induction into the Weber State University Athletics Hall of Fame. He later returned to the university, in 2002, this time as head tennis coach. 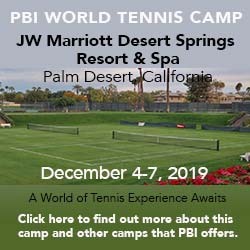 Now back at the Lodge, his twin focus in on members and guests, offering a blend of clinics, camps, and custom-tailored programs, supplemented by a well-attended (40+ players) Saturday morning drop-in doubles. Game matching is also a priority. One change since his earlier stint: the club has added four permanent, lighted pickleball courts to supplement its eight lighted hard courts. Courts & Fees. There are currently lighted 8 courts at the Lodge, one of them a stadium, and two premier courts now set up as four permanent pickleball courts. Fees: $15/hour. Golf Courses. The Lodge has two award-winning 18-hole golf courses, The Canyon and The Mountain, both designed by Tom Fazio. They are known for their rugged beauty and use of the natural terrain in ways that are at once challenging and environmentally sensitive. Spa and Fitness Center. Their day spa offers a variety of treatments while the renovated fitness center now has Technogym Cardio and workout equipment. A variety of classes are available as is access to a personal trainer. And ... A 25-meter outdoor lap pool doubles as the venue for a varied aquatics program, including swimming instruction for all ages and levels. It has now been supplemented by a free-form recreational pool, with a splash pad for kids, a border of umbrella tables and lounges, and a cafe for snack. Hiking trails leave from the property itself into and along the surrounding hills. Every guest has a one- or two-bedroom suite remarkable in size. Even the smallest has 800 square feet of space to sprawl out in, while the largest range up to 1,500 square feet. All have kingsize or two queensize beds, pull-out leather sofas, fully equipped kitchens, large bathrooms with walk-in showers, and spacious private balconies or patios. Smoking in the rooms is prohibited; however, the resort is pet-friendly. The resort's signature restaurant, the Catalina Room, serves eclectic menu long on fish, chicken, and beef, with many of the entrées available in both full and half portions. The room has floor-to-ceiling windows with views of the Santa Catalina Mountains and al fresco dining on its outdoor terrace. You have a choice of a 1-bedroom or 2-bedroom suite. Check the hotel for rates during the period you want to visit. Travel Instructions. The Lodge is 35 minutes from Tucson International Airport (TUS) and roughly 20 minutes from downtown.